My parkrun trail today took me to Hogmoor Inclosure which is in Bordon in Hampshire. This is in fact my local parkrun, or at least my nearest, being only about six miles from my front door. Perhaps I should have got here earlier than its 25th running but I was saving it for a day when I needed to be back home early. Today was the day! Bordon, or Whitehill and Bordon to give it its full title, is a medium sized town on the eastern side of Hampshire. For many years Whitehill and Bordon were two small inconspicuous settlements on the A325 heading south from Farnham. Then in the 1890s the army decided to create a new army camp here, probably as an overspill from nearby Aldershot. The first troops to be garrisoned here were either heading off to or returning from the Boer War. In two world wars Bordon became a major base for Canadian troops, a fact recalled in the names of some roads and buildings. At its peak Bordon hosted many thousands of soldiers. There were cafés and dance halls and cinemas and other facilities to cater for them. 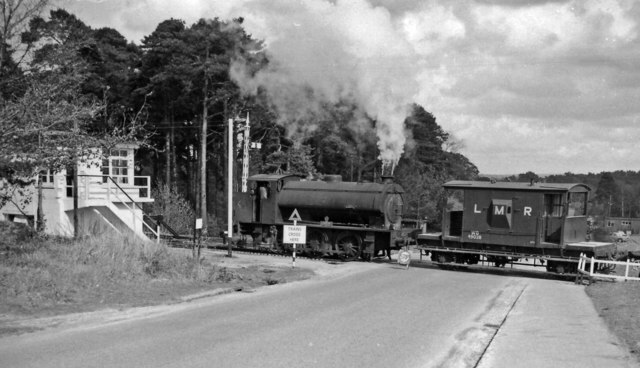 Bordon also boasted its own military railway to transport troops and supplies. After the second world war Bordon continued to function as an army town though, as the British army reduced in size, so the number of troops stationed here also diminished. The last army unit to be based here was the REME (Royal Electrical and Mechanical Engineers). In its later years Bordon was looking rather tired and shabby. In this corner of the world it was something of an anomaly. To the east you had a corner of stockbroker belt Surrey, all Range Rovers and million pound houses. To the west you had picturesque rural East Hampshire (also known as Jane Austen country) And in between there was this rather shabby place with rows of gloomy barracks, dreary looking depots and warehouses and a ramshackle parade of shops. Bordon always had a bit of a rough reputation round these parts. Any reports of crime in the local paper - car theft, drug dealing or whatever - the miscreants always seemed to come from Bordon. And now the good news! When the date was revealed for the army to finally pull out of Bordon (December 2015 as it turned out) the government announced that Bordon would be one of four new Ecotowns. Hundreds of millions of pounds would be spent on building new roads, new facilities and new homes. The plan was to provide some 3,350 new homes; 5,500 jobs and create nearly 100,000sqm of new commercial, retail and leisure floor space. The town centre was to be remodelled with new retail and business parks, new schools and leisure facilities. The plan also allowed for some green spaces to be retained. Hogmoor Inclosure is a triangle of land, of pine forest and sandy heathland, that was formerly used by the army for training and the testing of vehicles. You can still see the odd sign saying ‘Beware - tanks crossing’! As part of the redevelopment plan, this corner of Bordon was set aside to become a recreational area and a nature reserve. The plan includes the building of a car park, a visitor centre and café and an adventure playground. Most of this has yet to be built (apart from the playground) but we hope it will be in place soon. In the meantime the Inclosure can be used as a parkrun venue. The parkrun here started back in March and has proved popular with an average attendance of around 160. Presumably, by the year 2030, with thousands more people living in Bordon, the attendance will have increased proportionately. The course consists of two laps around a sort of figure of eight course with a smaller loop at the north end and a larger loop at the southern end. It is gently undulating and mainly on sandy paths. Many of the paths are firm and flat but the section around the southern lap is rather bumpy and uneven with lots of loose sand (and puddles in winter). I wasn’t entirely sure how I was going to go today. I have been suffering a bit with my joints lately Some days it’s been “I really need to have a rest!” and other days it’s been “actually it’s not too bad, I can carry on running”. Today was a relatively good day so I decided to go for it. I didn’t get away too well but then I never do. There was a young man who shot off very fast and vanished into the distance. Behind him there was quite a large group. I gradually caught up to this group then worked my way through so that by the end of the first lap, passed in just over ten minutes, I was on my own in second place. The second lap was a bit of a solo effort. I couldn’t see the runner ahead of me nor hear anyone behind. I kept going reasonably steadily and crossed the line in 20:24 for second place. That was fine, especially for that course. I actually enjoyed the Hogmoor course and might even come back here to do some some training. I will in all likelihood make further visits to this parkrun, especially in winter when I don’t want to travel far. It was quite a novelty for me being back home at 10 AM on a Saturday! My statistics for today - that was parkrun venue number 175. I was first in my age group and first overall on age graded scores. I shall finish off as usual with a YouTube video from a previous event. If you’d like a glimpse of the course, here it is!